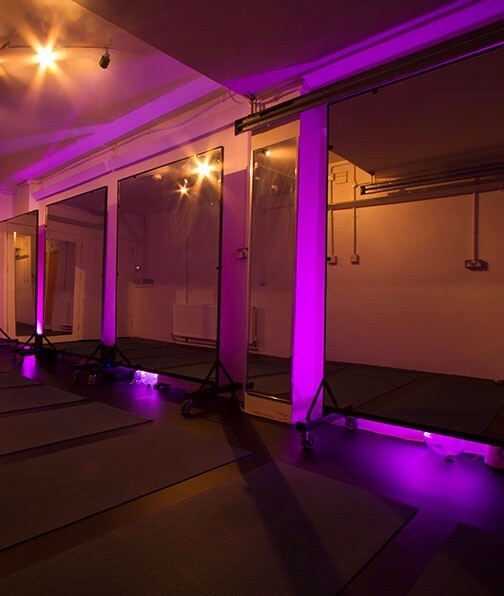 We have a unique and stylish studio with mood lighting, infra red heaters, humidifiers and an oxygen intake vent to ensure your experience of HOT yoga is a great one. We have also laid a high quality Harlequin dance floor which is one of the most hygienic hot yoga flooring materials on the market. Each and every student gets a front line position in the mirror, heightening your experience. We offer 3 types of HOT classes. Spaces are limited so make contact today to make sure you don’t miss out. Hot Yoga is a unique style of yoga whereby the studio is heated using infrared heaters to a temperature of 40 degrees. The style of yoga is Hatha with the classic 26 postures (originally sequenced by Bikram Choudhury) being repeated twice in every 60-75 minute class. These postures are held anywhere between 30 seconds and a minute. Each class begins with Pranyama (breathing technique) and ends with Pranyama followed by Savasana. Stretch carried out a 550 hour master course in Hot Yoga at Ethos Hot (now SOMA) (soma.house) which is affiliated with the University of Cambridge. The training was extremely thorough and his knowledge of the practice of hot yoga is extensive. The classic 26 postures of the Bikram series were designed in a way that would be suitable for people of all ages and abilities with varying levels of health and fitness to practice side by side. If however you have an injury which concerns you, have a chat with Stretch before class and he can ensure that your practice remains safe and that you stay within your boundaries whilst you work towards healing your body. SILENT HOT – A slightly shorter and faster version of the classic HOT sequence still incorporating all of the 26 postures in 60 minutes! This class is for those of you who have done a few hot classes already and are familiar with the sequence. The teacher will be leading a class from the mat and will simply cue “Go” and “Change” to come in and out of the postures. You don’t need to know the sequence off by heart but you do need to be able to practice safely as there are no alignment cues during the session. This is a great way to connect more with your breath in the hot room and we thoroughly recommend it to anyone who practices hot yoga on a weekly basis. HOT FLOW – Based around the poses of the Ashtanga Primary Series and involves more movement than the classic HOT sequence and so the room is kept at a slightly cooler temperature (30-35 Degrees) We recommend you have a broad knowledge of how to do a sun salutation before attending this class. HOT FUSION – Hot Fusion is a sequence inspired by the Baptiste Power vinyasa practice, which combines power and strength with softness and ease. It sits perfectly between the static, strength building Hot Yoga 26 postures and the more fluid, dynamic Hot Flow sequence With a large focus on how we breathe in postures and transitions, this class will challenge, cleanse and invigorate; preparing you both for a good night sleep or busy day ahead. At 32-34 degrees, you will sweat more than usual, helping to shift stagnant energy. Expect to leave feeling calm and centred and ready for whatever life throws at you. HOT YIN – A class focused on deep stretches that are held from 2-5 minutes in a warm room with a temperature of 32degC. The poses will help to stretch out hips, shoulders and spine, working into connective tissue, fascia as well as muscles. The benefits of practicing this style in warmth include accessing postures easier than in colder environments, boosting detoxification and promoting relaxation. Beginners to yoga are very welcome. If you haven’t attended one of the classes in the Vinyasa studio and yoga is new to you then we would recommend either the HOT YOGA or HOT YIN classes in the HOT studio or the FOUNDATION or MELLOW classes in the Vinyasa studio as a great starting point. *Please note all classes at Oceanflow Yoga are done on a pre-booked basis. We do not offer a drop in service. This is to ensure we don’t have to turn anyone away if we are full up. We also operate a 3 hour cancellation policy with all of our weekly yoga classes.